Well, I've got good news and bad news. 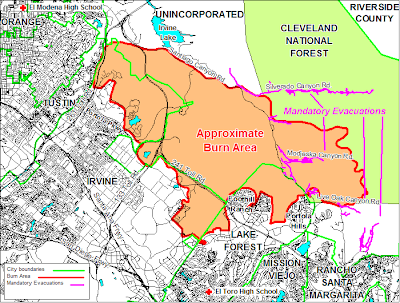 The good news is that the fire hasn't yet burned my two favorite hiking areas, contrary to earlier reports. The bad news is that the fire (as of this morning) is now heading in the direction of ONeill Regional Park and Holy Jim Falls. So I'm keeping my fingers crossed.